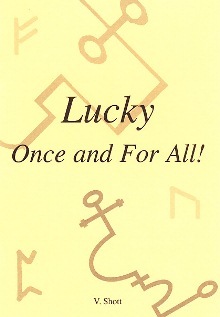 Become lucky not just once in a blue moon, but all of the time! It seems crazy, but its true  you can make your own luck to order. Its done through magick, that supernatural agency of ordering physical circumstances by spiritual means! Many books abound on the subject of magick, but few pack as much practical ready-to-use information! Page after page demonstrates how you can bring good luck to order by the powers of magick! AND YOU WILL MARVEL AT THE RESULTS. Yes, you can change your luck  ONCE AND FOR ALL! But how can this be so? 90% of the problem with luck is timing, doing something at the right moment can make you lucky  and doing it another time can mean no luck. One way of avoiding bad luck is the observation of omens and signs  but how does one actively encourage good luck? And how can one see the signs that forecast it? The precise instructions are here for you  and they are simple! EXPLAINED IN A SIMPLE DOWN-TO-EARTH MANNER, SO THAT THE COMPLETE BEGINNER CAN START IMMEDIATELY! This book is about magick  not positive thinking. It is not about prayer and not about visualisation! MAGICK is so called because it makes things happen in a way that cannot be rationally explained! YOU NEED THIS INFORMATION TO CHANGE YOUR LUCK RIGHT NOW! IT WORKS! You will find it will! Stupendous good luck is always there waiting to happen  but we cant see it! You can have the luck to receive money when least expected  regardless of how desperate or hopeless your present circumstances! You can have the luck for someone who left you to return. And by magick  not visualisation! You can have the luck of a disagreeable person getting out of your life  and of his own choosing! You cannot come to harm. No devils here  on the contrary, you can defeat any curse or voodoo hex! You can rid yourself of the scourge of continuous bad luck! Whatever your problem  and we mean whatever  you can find the appropriate magick for it in this detailed book! This book is by a man with over 50 years of experience in the magickal arts! You need solid, proven instruction  which has been tried and tested over and over again! Who can explain lifes injustices and inequalities? DONT ENVY ANOTHERS GOOD FORTUNE  FOR IT MAY RUN OUT. What you are going to get in this book is more important  not to be just lucky once or very occasionally, but continuously, no matter what. And when others envy your new found good luck and fortune, you will have the magical know-how to stop the evil eye. You will keep evil at arms length. To be truly lucky, you need to be out of harms way. Do you wish for the luck of respect from your children? You can gain that  and their love too. chronic pain? You can have the luck for all that to go. THIS BOOK REVEALS WHO YOUR ENEMIES ARE. You are shown exactly how to find out, and what you can do about it. missing people. This book shows how to find out. Getting a better job  what to do, and tells you how to know in advance whether youll get it or not. ACCESS TO UNLIMITED MONEY. Impossible? To most people, yes. THIS BOOK REVEALS WHAT YOU MAY NOT FIND ELSEWHERE.